The four year old chestnut daughter of Not A Single Doubt, relished the short trip, and was greatly advantaged when the well-tried Rhyming Puppet didn’t contest the lead. 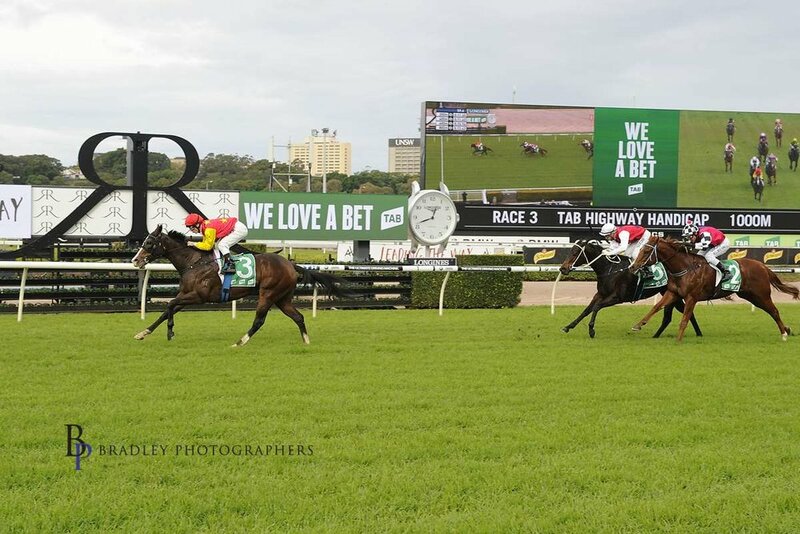 “I was pleased to see Sei Stella left alone, because she was a touch too anxious in front, and may have overdone it if pressured”, said trainer Matthew Dale over the weekend. “She was having only her fifth start, and hasn’t learned to switch off just yet”. The Sei Stella story began when Matt received a phone call from owner breeder John Lynch, a couple of years ago. John had noted Matt’s handling of Fell Swoop, a son of Not A Single Doubt, currently the winner of $1.8 million. “I had a look at the filly at John’s property, and we agreed she needed more time”, recalled Matt.” We left her in the paddock, and she didn’t race until March of this year as a mature three year old”. The young trainer admits that the fascination of the punt was the catalyst in drawing him to the racing game. His maternal grandparents, the late Allan Doyle and his wife Angela were regulars at Canberra and Queanbeyan race meetings. Their young grandson began tagging along at an early age, and his interest surged one day when a successful trifecta returned him $30.00. “My love of a bet was soon complimented by the excitement of racing, and my fate was sealed at age six”, explained Matt. Thoughts of becoming a jockey filtered through his brain, when he began riding ponies, but a couple of growth spurts put an end to those aspirations. The next adventure for young Dale was a stint at the University of Sydney’s Orange campus, where he gained a degree in Equine Business Management. He also gained an introduction to local trainer Johnno Johnson, who soon had the eighteen year old riding trackwork. His insatiable thirst for knowledge later brought him back to Sydney, where he gained valuable experience working for Gai Waterhouse and John O’Shea. To this day O’Shea will tell anyone who cares to listen that Dale’s professionalism was evident from the outset. Matt was barely twenty when he, and his mate Rodney Thompson shelled out $1250 for a tried horse called Jumping Jack Flash, at an Inglis Mixed Sale. A few months later the son of Grosvenor won a C4 at Queanbeyan followed quickly by a restricted win at Warwick Farm. His only other win was the Adelong Cup at Gundagai, but what a job he’d done for just $1250. “Before long I had four or five horses in work, but I was still a long way off solvent”, recalled Matt. “I owned only three decent feed bins, and had to borrow two buckets out of Mum’s laundry, which doubled as feed bins”. The young trainer’s first genuine client was a man called Michael Thomas, later to find racing prominence as the owner of the wonderful Happy Clapper ($6.4 million). Michael gave Matthew a yearling colt by Bite The Bullet out of Winifred’s Prayer, and the story had a very happy ending. As Gunfire Messiah, he won his first two races at Forbes and Narromine, followed by an effortless three year old win on the Kensington track. 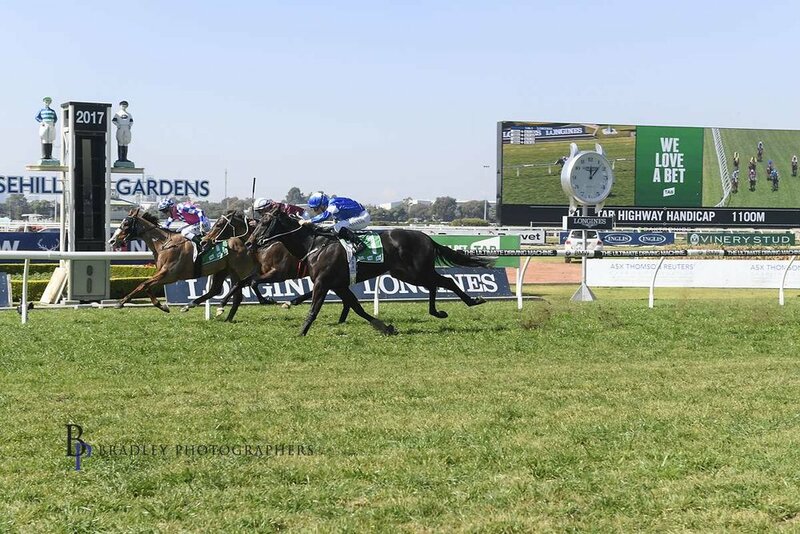 He then gave connections a thrill with a slashing fifth (2.2 lengths) in the Gloaming Stakes behind subsequent Group 1 horses like Al Maher, Savabeel and Outback Prince. Gunfire Messiah won another three races for Matt before being transferred to Peter Morgan in Victoria. Interesting to note that the trainer is currently educating a two year old half-brother to Happy Clapper for Michael Thomas. Matt has produced a regular flow of winners over the last decade. Unanimously, Rocket Commander and Lebrachaun were all good winners for the stable, while Clipper, Hay Now, Hermosa Beach, Super Star Bob, Bitburg, Shadow Affair, Thelittleracketeer, Mossman Gorge and Royal Jackpot all won TAB Highways. Jackpot Queen did a lovely job, winning races at Randwick, Caulfield and Flemington as well as the Wellington Boot of 2011. But the horse to propel Matthew Dale into the spotlight in recent times is the hugely talented Fell Swoop, winner of nine races and $1.8 million in prize money. This time last year he gave his many owners a rare thrill, by making the Everest field. He was at the end of his prep, and finished with the tail enders, but connections have dinner party material for years to come. The same horse has won two listed races, and one at Group 2 level, and his placings at Group 1 level are both frustrating and exhilarating. Following a long spell, Fell Swoop is coming along pleasingly, and should be back in action by the end of October. “He’s now seven and will take a bit longer to come to hand, but he’s very focused and working as though he wants to be there”, said Matt. Between horses and family, the trainer has an enormously busy lifestyle. He and wife Amy are the proud parents of a very lovely quartet- Amelie (6), Bella (4), Billy (3), and Lara (1). “I’m a full time horse trainer, and Amy is a full time mother, and there’s little doubt she has the biggest job”, Matt happily admits. He stables thirty horses at the beautifully appointed Thoroughbred Park training complex. Matt rides a lot of trackwork himself, and only last Saturday worked six horses before jumping on a 10.00am flight to Sydney, to watch Sei Stella win the TAB Highway. After toying with the idea for many months, Matt opened a ten horse satellite stable at Moruya a year ago. He rents stables on course, and is within eight hundred metres of the beach. His horses trot and canter on the edge of the surf, in varying depths of sand, and a number of winners have already proven testimony to the benefits of the sea change. “The moment one of the Canberra team appears to be a little stale, it will go straight to Moruya for a revitalizer”, said Matt. The South Coast operation is run by Jamie Stewart, who spent a decade working for trainers like Leon and Troy Corstens, John Sadler and Anthony Freedman. “He’s thoroughly experienced, rides them work himself and is a switched on horseman”, declared Dale. Image Courtesy of Bradley Photos. Clipper wins one of her two TAB Highway Events. At age 36, Matt Dale is about to embark on the journey of his dreams. With a grounding of close to twenty years already under his belt, he can now concentrate on fine tuning the many horses destined to pass through his hands, in the years ahead. This young man is a thinking trainer, who’s constantly trying to get into the heads of his horses, and he usually finds a way. He’ll be competing against an army of talented trainers, some of whom will have the luxury of three or four times the number of horses. The smaller trainers have to learn not to be intimidated by the sheer weight of opposing numbers. All they can do is strive to present their horses, at the absolute top of their game, and pray for a little bit of racing luck. When that bit of luck comes his way, Matt Dale will make his presence felt. Newer PostTHEY DON’T COME ANY MORE PATIENT THAN LES BRIDGE.